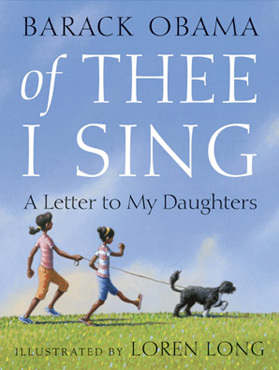 It’s almost President’s Day, which is the perfect time to review of THEE I SING: A Letter to My Daughters by former president Barack Obama. The book honors many historical figures who made a difference in America, and more importantly it is a beautiful letter from a father to his daughters about his love for them and hope for their future. For that reason, it is sure to be a much loved American classic. of THEE I SING highlights activists and social reformers, artists and inventors, presidents and others that children may or may not have heard of, but should know about. Reading the book to your children will not only educate them, but empower them, giving them confidence to want to make their own mark in this world. In of THE I SING, Obama tells his children stories of trailblazers who remind him of their own wonderful traits – bravery, creativity and strength. He tells of artistic, political and even scientific strides made by different trailblazers from the United States and abroad. Some of the people featured are Abraham Lincoln, Martin Luther King Jr., Helen Keller and Sitting Bull. He tells of their work and the extraordinary progress each made that made our world a better place. The last page of Of Thee I Sing includes mini bios of each extraordinary individual’s beginnings. The beautiful prose and colorful illustrations by Loren makes the book a treasure. I highly recommend it, because it is a great history lesson for children, it promotes respect for all people, and it acknowledge the contributions and gifts that all people, regardless of race, disability or religion have brought to our world, and to our lives. This entry was posted in Activism, Courage, diversity, Historical, political, Racism, Uncategorized, Women in History and tagged Abraham Lincoln, Barack Obama, Billie Holliday, Cesar Chavez, children's book, George Washington, Helen Keller, Jackie Robinson, Martin Luther King, MLK, non-fiction, Obama, President's Day, Sitting Bull. Bookmark the permalink.